Las arterias coronarias llevan sangre con oxígeno al músculo del corazón. La enfermedad de las arterias coronarias (CAD, por sus siglas en inglés) es la obstrucción de estas arterias. Si la obstrucción es completa, es posible que se dañen ciertas áreas del músculo del corazón. En los casos graves, este músculo muere. Esto puede generar un ataque cardíaco, también llamado infarto de miocardio (IM). Consuma una dieta saludable para el corazón con bajo contenido de grasas saturadas , carne roja y carnes procesadas, y rica en granos enteros, frutas y verduras . Si fuma, deje de hacerlo . Arora RR, Chou TM, et al. The multicenter study of enhanced external counterpulsation (MUST-EECP): effect of EECP on exercise-induced myocardial ischemia and anginal episodes. J Am Coll Cardiol. 1999;33:1833-1840. 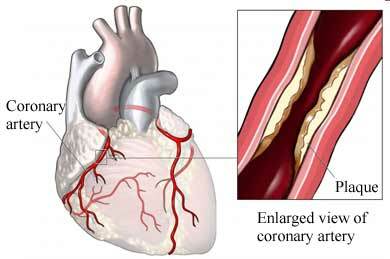 Coronary artery disease–Coronary heart disease. American Heart Association website. Available at: http://www.heart.org/HEARTORG/Conditions/More/MyHeartandStrokeNews/Coronary-Artery-Disease---Coronary-Heart-Disease%5FUCM%5F436416%5FArticle.jsp. Updated September 2, 2014. Accessed September 15, 2014. Coronary artery disease (CAD). EBSCO DynaMed website. Available at: http://www.ebscohost.com/dynamed. Updated August 22, 2014. Accessed September 15, 2014. What is coronary artery disease? National Heart, Lung, and Blood Institute website. Available at: http://www.nhlbi.nih.gov/health/dci/Diseases/Cad/CAD%5FWhatIs.html. Updated August 23, 2012. Accessed September 15, 2014. 4/10/2007 DynaMed's Systematic Literature Surveillance http://www.ebscohost.com/dynamed : Boden WE, O'Rourke RA, Teo KK, et al. Optimal medical therapy with or without PCI for stable coronary disease. N Engl J Med. 2007 Mar 26. 11/7/2007 DynaMed's Systematic Literature Surveillance http://www.ebscohost.com/dynamed: Bravata DM, Gienger AL, McDonald KM, et al. Systematic Review: The comparative effectiveness of percutaneous coronary interventions and coronary artery bypass graft surgery. Ann Intern Med. 2007 Nov 20. 1/6/2009 DynaMed's Systematic Literature Surveillance http://www.ebscohost.com/dynamed: Surtees PG, Wainwright NW, Luben RN, Wareham NJ, Bingham SA, Khaw KT. Depression and ischemic heart disease mortality: evidence from the EPIC-Norfolk United Kingdom prospective cohort study. Am J Psychiatry. 2008;165:515-523. 6/5/2009 DynaMed's Systematic Literature Surveillance http://www.ebscohost.com/dynamed: Sinha R, Cross AJ, Graubard BI, Leitzmann MF, Schatzkin A. Meat intake and mortality: a prospective study of over half a million people. Arch Intern Med. 2009;169:562-571. 7/6/2009 DynaMed's Systematic Literature Surveillance http://www.ebscohost.com/dynamed: Kodama S, Saito K, Tanaka S, et al. Cardiorespiratory fitness as a quantitative predictor of all-cause mortality and cardiovascular events in healthy men and women: a meta-analysis. JAMA. 2009;301:2024-2035. 7/6/2009 DynaMed's Systematic Literature Surveillance http://www.ebscohost.com/dynamed: Fung TT, Malik V, Rexrode KM, Manson JE, Willett WC, Hu FB. Sweetened beverage consumption and risk of coronary heart disease in women. Am J Clin Nutr. 2009;89:1037-1042. 2/12/2010 DynaMed's Systematic Literature Surveillance http://www.ebscohost.com/dynamed: FDA approves new indication for Crestor. US Food and Drug Administration website. Available at: http://www.fda.gov/NewsEvents/Newsroom/PressAnnouncements/ucm200128.htm. Published February 9, 2010. Accessed September 15, 2014. 11/26/2012 DynaMed's Systematic Literature Surveillance http://www.ebscohost.com/dynamed: Kivimaki M, Nyberg S, Batty G, et al. Job strain as a risk factor for coronary heart disease: a collaborative meta-analysis of individual participant data. Lancet. 2012 Oct 27;380(9852):1491-7. 7/21/2014 DynaMed's Systematic Literature Surveillance http://www.ebscohost.com/dynamed: Afshin A, Micha R, et al. Consumption of nuts and legumes and risk of incident ischemic heart disease, stroke, and diabetes: a systematic review and meta-analysis. Am J Clin Nutr. 2014 June 4;100(1):278-288.